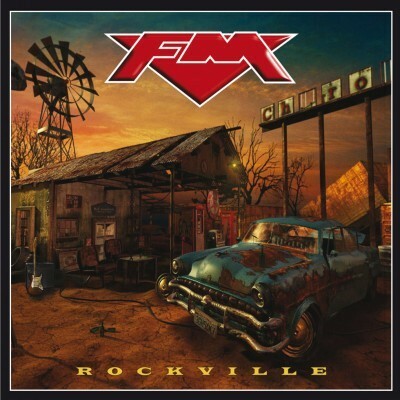 For more than 25 years, on and off, the music of FM has delighted AOR fans, and there was a general sense of despair when they called it a day in the 90s after falling foul of grunge and general apathy to melodic rock. The nagging powers of our own Kieran Dargan got them to play at Firefest a few years back and the rest is history. Now releasing stuff through their own company with no interference from execs and arseholes, FM seem to be stronger than ever, with the big question being can this measure up to their excellent comeback album 'Metropolis'? Really, was there ever any doubt? 'Rockville' is as good as anything FM have released throughout their history. It's bouncy, catchy, soulful and heavy when each is called for. It kicks off with 'Tough Love', a track that grabs you by the balls and won't let go with its big riff and catchy chorus. This is followed by the extremely soulful (but still rocking) 'Wake Up The World', the recent EP lead track 'Only Foolin' and the insanely catchy 'Crave', possibly the jolliest sounding break up song ever written. Just these four tracks will tell you that FM are back and ready for action, and it's definitely the best opening salvo I've personally heard in years. Steve Overland sounds fantastic as ever, and the mix is incredibly clear to boot, allowing everyone to shine. The quality doesn't stop at four, and the band has yet again thrown an album out without a single duffer in sight. Those who like their AOR to have a bit more bite will love 'Crosstown Train', a furious guitar led piece that will have air guitarists punching the sky, whilst those who like a good old FM ballad should enjoy 'Story Of My Life', the only really wimpy track on offer. Elsewhere there's a plethora of sing-along choruses, one of the best being on 'Better Late Than Never', coupled with some strong guitar solos that could only come from Jim Kirkpatrick. It's one of those albums where you will pick favourite songs, only to change your mind a week later as other creep into your psyche. Currently I'm stuck on 'Crave' but I just know it will soon be edged out.